Having a beautiful garden is something that every home owner would like to indulge in. A well-tended garden has the potential to add beauty, color, and joy to a person’s life. However, to have such a beautiful garden a lot of care is needed and constantly running in and out of the house to get the right gardening tools to assist you in pruning, cutting, and watering your plants can be a bit of a burden. This is where the need for a garden shed comes in. It facilitates quicker access to tools – A garden shed will speed up the whole gardening process by making all your tools available at arm’s length. When it comes to these kind of tasks, saving time can be quite a motivating factor for building a garden shed. Facilitates better and more simpler gardening – With a garden shed, organizing your equipment is made easier, thereby making selection of the right tools fast and more efficient. The thing about a garden shed is that it contains shelves and storage areas that are meant for particular tools. Without a garden shed, you will have to figure out in which temporary storage place you last placed these tools. However, with a garden shed, all you need to do is open the door, go to the area designated for those tools and put them to use. Helps avoid clutter – Keeping all your gardening equipment in a shed will take away the unsightly clutter that would have otherwise been there in your garden. Having a bag of unused tools, manure, and pots scattered around your beautiful garden can be an eyesore and unappealing. This is why building a shed in your backyard can be beneficial and its construction is not that hard if you follow the instructions accordingly. A well-designed garden shed will not only declutter your garden, it will also provide a comfortable work space as well as an attractive backdrop for prized plants. It will also allow you to keep try and still perhaps accomplish some tasks during inclement weather. Even when Mother Nature disagrees with you, you do not want to be inside your home all day. A shed gives you the opportunity to keep the water off of you while still taking care of some things outside. With a garden shed you have the ability to extend your outdoor experience greatly ― organizing items used for gardening, sports activities, or outdoor hobbies in it. 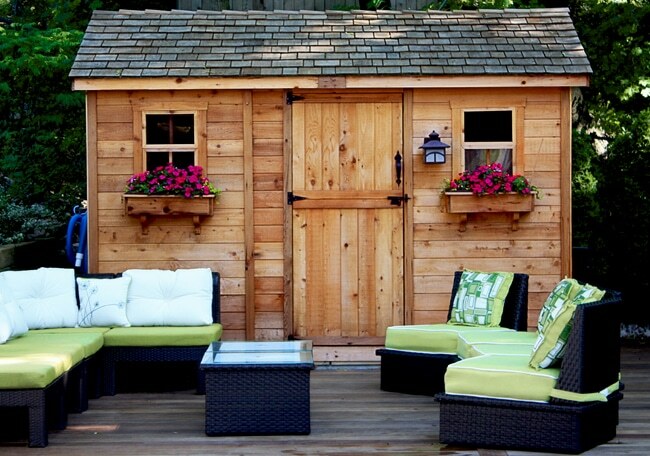 The current trend favors the use of plastic and wooden sheds to decorate the garden area. A shed can vary in terms of complexity, size, and price of construction. Right from sheds with small, tin-roofed structures to large wood framed sheds to sheds with shingled roofs and windows – the types and styles of wood sheds for you to select are numerous. Wooden sheds – Wood is the traditional material used for making garden sheds. If you choose wood, Western Red Cedar should be on the top of your list. Eco-sheds – With people concerned about saving the environment, they are moving toward creating eco-friendly garden buildings. Metal sheds – Gable and metal sheds are the easiest in terms of construction and are also economically feasible. Plastic sheds – Plastic tool sheds seem apt for storage of small items. Press the button to make use of pre-cut wooden wall panels that come in different shapes adds a unique touch to your shed. You can choose to go with a gable roof design which is bound to make your shed look comfortable and charming. Wooden sheds are a popular trend as they blend well with the surrounding greenery and pull off a nice natural look, though they do need regular maintenance. If you are looking for economic feasibility, aluminum and wood sheds are the best option. A metal shed will guarantee durability and stability, however, they have a very industrial look that can be unappealing. Choosing a plastic shed can be a smart decision since they do not require regular maintenance and they are capable of sporting varied designs and patterns. By adding flowers, vibrant lighting, some furniture and decoration, your garden shed can be converted into an eye-catching part of your backyard design. By keeping these pointers in mind, making sure you construct the right kind of garden shed will no longer be an issue.